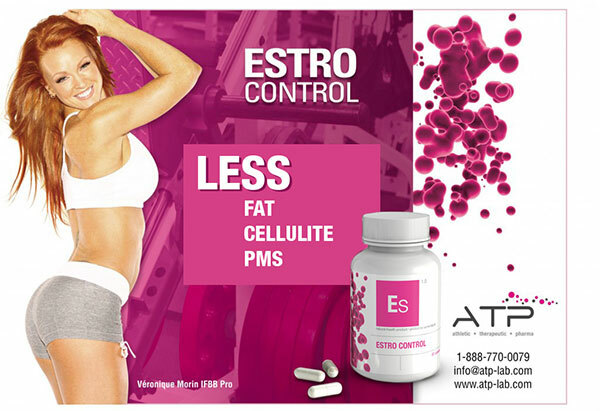 A unique and revolutionary formula to promote female hormonal balance. A small dose of vitamin D was added to prevent a possible epidemic deficiency. Several studies show that a vitamin D deficiency can encourage the development of certain types of cancer, including colorectal, breast, and prostate cancer. Vitamin D is also an effective immune system mediator. The effective dose of vitamin D varies greatly from one person to another, and for this reason we have added only a weak dose of 100ui per capsule. The best way to gauge one’s vitamin D requirement is the 25-OH vitamin D blood test, and the optimal result is between 75 and 150 nmol/L. Green tea extract is used in our formula for its exceptional antioxidant properties. Epigallocatechin-3-gallate (EGCG) extract is among the most powerful active ingredients in green tea. The addition of 90mg of ECGC, standardized at 45%, is equivalent to several cups of green tea. Green tea cleanses the body, thus promoting the elimination of toxins harmful to proper metabolism. Curcumin is a powerful anti-inflammatory, antiseptic, anti-carcinogenic, and hepatic detoxification agent… used for over 2,500 years in India to treat inflammation, intoxication, and cancer, curcumin’s reputation precedes it. We use it in this formula to promote the detoxification of the body, in particular due to its strong effect on the liver. DIM (diindolylmethane) is a cruciferous indole found in broccoli, cauliflower, Brussels sprouts… DIM has a positive effect on hormonal health by promoting the proper functioning of certain enzymes that stimulate healthy estrogen metabolism in women and men. DIM adjusts estradiol levels by converting it to less harmful metabolites. Calcium D-Glucarate is the D-glucaric acid salt. Taking a calcium D-Glucarate supplement inhibits beta-glucoronidase, a phase 2 detoxification enzyme. Throughout this phase, carcinogenic chemical products, steroid hormones, and other liposoluble toxins bind to the glucoronic acid in the liver and are then excreted by the biliary tract. This process is called glucoronidation, and it is the chief method of excreting estrogens such as estradiol, as well as cholesterol and a number of other carcinogens. Bioperine ( Pipérine ) is the active ingredient in black pepper. It is now being used to help increase bioavailability and absorption of certain natural compounds . EgCGs from green tea , Resveratrol and curcumin are particularly affected by it. Bioperine will greatly improve bioavailability and blood concentration for these natural ingredients. Trans-Resveratrol is a probably one of the most popular phenolic compound , especially for its fantastic antioxidant capacity. This stillben is remarkable indeed , at low concentration, studies have shown that Resveratrol has the capacity to block estrogen’s actions and to even block part of her production at higher doses .His action on estrogen are based partially on the fact that Resveratrol is a SERM ( selective estrogen receptor modulator ) like the drugs Tamoxifen and Clomiphene . This on its own make it a great ally in the fight against hormonal imbalances that are more and more frequent in our day and age . More good news have been discovered in this compound, the powerful anti-inflammatory properties of Resveratrol could slow down or even even prevent the development of certain pathologies like diabetes and cardiovascular problems. It’s common knowledge now that cruciferous vegetables are known to help for their anti-cancer properties and to positively modulate estrogen levels . For many years , diindolymethane which is present in these vegetables , has been in use to help healthy estrogen metabolism. It’s only recently that science as isolated another very interesting component present in cruciferous vegetables , especially broccoli sprout , the mighty sulforaphane. Known since the late 90’s , this isothyiociante has been recognized for having anticancer properties notably by inducing cell apoptosis ( death ) . It also as the capacity to reduce estrogen receptors and could heptaic detoxification of estrogens and xenoestrogenes. 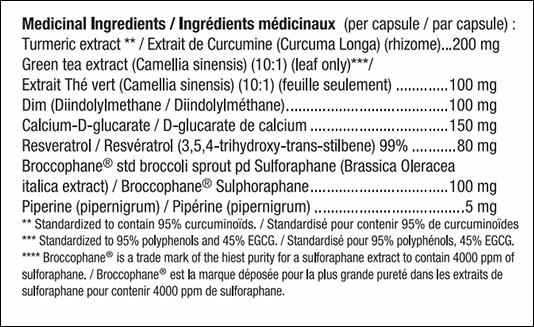 It is really important to verify the source of sulforaphane since this compound is really fragile . Recommended use or purpose: Provides antioxidants for the maintaining of good health. 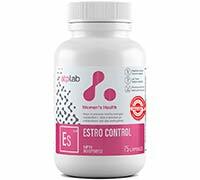 Helps to support/promote healthy estrogen metabolism/balance. Recommended dose: Adults: Take 1 capsule daily with meals. Take a few hours before or after taking other medications. Recommended duration of use: Consult a health care practitioner for use beyond 12 weeks.